Your Dog Rescue Organizations Page is on Doobert? Did you know that you have a public page for your organization on Doobert? At Doobert we’re all about helping you save time so you can save more animals. Every organization on Doobert has a public page that they can edit and maintain with useful information about their organization. You can have it display your contact information, rules for working with you and even transports that you are trying to fill. 3. Here you can edit the information about your organization. 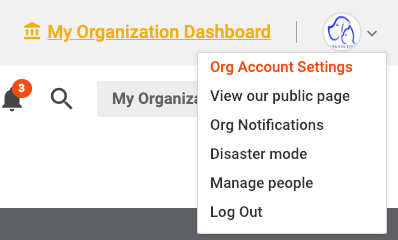 If you want to change your privacy settings, simply go back to the organization profile list and choose “Change organization privacy settings” and you can indicate what you want to display. Notice the link to “View our public Doobert Organization profile” which will show you what information is currently displayed and it also shows you the URL for your public profile. You can link to this URL from your organization’s website, emails, social media, etc. to make it easy for your volunteers to see your information and open transport legs. When you publish your transports on Doobert, they’ll automatically email out to the Doobert volunteers relevant for that transport. But what if you want to make it easy for your non-Doobert volunteers to know about your open transport legs? No problem! 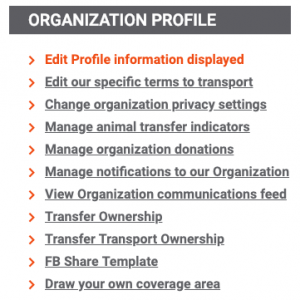 When you publish a transport, Doobert will automatically display the open legs on your organization profile page so that non-Doobert volunteers can click on them and sign-up to help you.